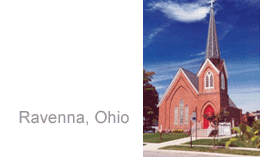 Grace Episcopal Parish, of Ravenna, Ohio was formed in 1865. 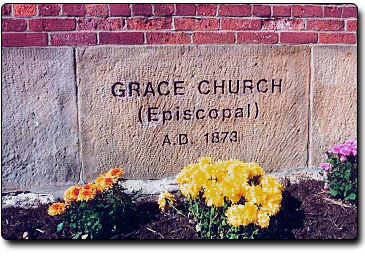 The cornerstone of Grace Episcopal Church was laid on June 17, 1873. The land was purchased by Captain Fredrick Coffin who was one of 15 whaling captains from Nantucket, MA. His family lived in a home built in 1848 that the church later purchased in 1918, and now serves as the rectory. The Southern Colonial style of the structure was inspired by country churches visited by some of the members of Grace Church while in service during the Civil War. The cost of the building was $8,000. The Church was comprised of 44 communicants. After several years of fund raising, the church was able to purchase a two manual pipe organ, which was installed on March 5, 1896. The Church received two major gifts in 1937. The first was the present Altar, which came from St. Paul’s Church in Canton. The second gift was the pulpit, which was given by Grace Church in Cleveland. The Church faced a crisis in the late 1930’s. The building was badly in need of repair. It was recommended that the parish status be reduced to mission, and the building be condemned. The Church fought and won the decision to remain open and repair the building. The entire west wall was rebuilt, and a new roof with steel girders replaced the old one. During the remodeling, seven new stained glass windows were installed. Services were held in the two-room parish house. The parochial report showed 92 communicants. In 1951 the rectory was renovated, and in 1955 extensive expansion plans were made for the Church and Parish Hall. The supporting walls of the Church were rebuilt. The basement floor was lowered, cemented and red brick faced to match the style and architecture of the Church. By the late 1950’s the Church had grown to 313 communicants. In 1965, in anticipation of a Centennial Celebration the inside of the church was painted and new carpet laid throughout. New cement steps and sidewalks to the street and parish hall were laid. Unfortunately due to the loss of leadership the Centennial Celebration was never held. For the next several years, little other than normal repairs was done to the Church. The next major renovation occurred in 1994 when the parish hall kitchen was completely modernized. 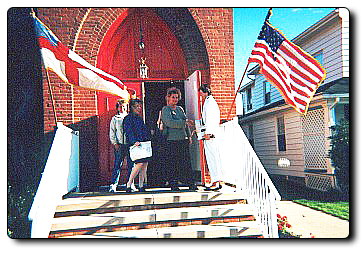 The Church, in 1995, underwent a handicapped accessibility project. And in 1998, with the contributions of time and talent of many parishioners, the Church Rectory renovation was completed. In 2000 air conditioning was added to the sanctuary and the roof was completely replaced. In 2002, we celebrated the completion of the sanctuary renovation. 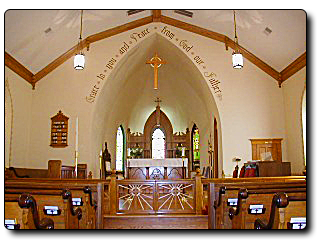 The improvements included, new plaster and paint, new flooring, new electronic organ, repairs and replacement of stained glass windows, redesign of the communion and altar area which includes moving the altar out towards the people, and the addition of decorative stenciling, painting and wording throughout the Church. 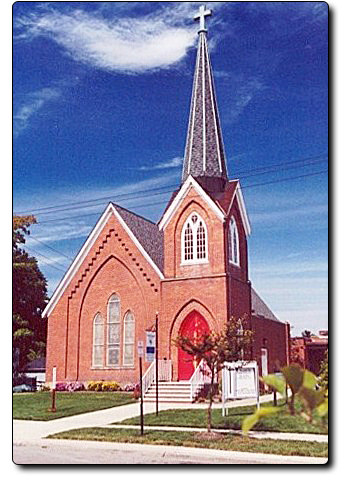 Grace church was formed just following the Civil War and it remains and continues to prosper today. The Church currently has 200 parishioners. While the structure has changed over the past 137 years, the basic value remains the same. It is still a structure made by people as a dwelling place for the Lord. It is still the people who make it vibrant with their songs and prayers of worship!